Denver Mayor Michael Hancock has been bedeviled by citizens who are protesting his administration’s commercialization and giveaway of Denver Parks and open space, including protesters who have shown up at public appearances of the mayor and members of his cabinet. Moreover, there has been increasing media coverage of his actions regarding parks and open space to his administrations ire. Westwords front page story for its December 31 edition was Titled “Parks and Wreck – In Mayor Hancock/s world-class city, everyone matters – except park lovers,” written by Allen Pendergast. The story blasts Hancocks commercialization of the city’s parks and the giving away for development of a portion of Hentzell Park. Park advocates are also gaining important allies in their fight against the powerful Denver mayor. Wellington Webb, the popular former mayor of Denver, and his wife Wilma recently joined Friends of Denver parks, the group that is fighting for Hentzell Park, and is the plaintiff in a lawsuit against the City. Reportedly the couple also made a generous financial contribution to the no-profit group. 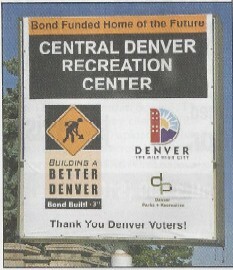 Webb wrote to the group, “I believe in the protection of Denver parks within the city and in the mountains. 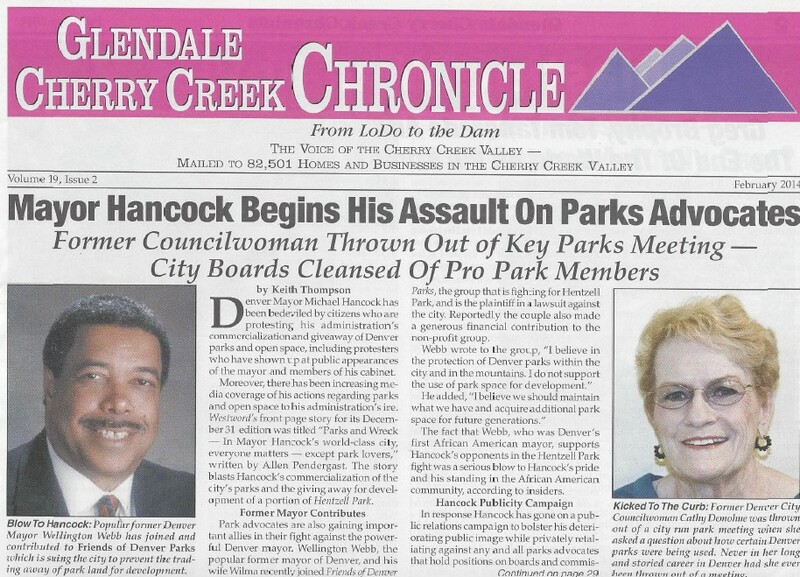 I do not support the use of park space for development.” He added, “I believe we should maintain what we have and acquire additional park space for future generations.” the fact that Webb, who was Denver’s first African American mayor, supports Hancock’s opponents in the Hentzell Park fight was a serious blow to Hancock’s pride and his standing in the African American community, according to insiders. While the mayor is publicly trying to soften his anti-park public image, his ad­ministration is purging all boards and com­mission of any and all parks advocates ac­cording to insiders. In addition they charge the administration is brutally attempting to publicly silence any critics including former City Council members. 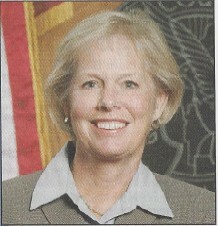 Former City Councilwoman Cathy Donohue was invited by a friend to attend a stakeholders meeting regarding the leasing out of city parks to commercial groups and was shocked to find out that there were al­most no parks advocates but simply city of­ficials and commercial groups in attendance as well as City Councilwoman Jeanne Robb. During the initial portion of the meeting Donohue raised a question concerning how some of the parks were being utilized. At a break the meeting facilitator hired by the city came over and demanded she leave. “I have attended literally hundreds if not thousands of meetings over my time in Denver and I have never ever been thrown out of a meeting. The Hancock administra­tion is trying to silence anyone and every­one that does not agree with its parks agen­da. It is truly shocking.” The Denver Parks and Recreation Advisory Board had voted 11 to 6 against Hancock’s plan to develop part of Hentzell Park. Since then Hancock has sought to kick all of the individuals off the board who voted against him and replace them with city employees and individuals associated with real estate lobbyists. In the meantime construction has began on the disputed Hentzell Park land not­withstanding the fact of the legality of using the land goes to trial on May 19,2014. The Colorado Court of Appeals denied the Friends of Denver Parks appeal of the de­nial of a preliminary injunction by the Dis­trict Court. The appellate court found that the Denver City Charter had abolished any “common law” dedication of parks in the City and County of Denver. Interestingly the Jefferson County District Court ruled on January 16,2014, in the case of Jefferson County/ School District v. City of Lakewood that there was in fact under Colo­rado law a common law dedication of parks and a school could not be built on land so dedicated absent a vote of the people. Attorneys for Friends of Denver Parks have indicated that an appeal of the deci­sion of Colorado Court of Appeals will be lodged with the Colorado Supreme Court. This entry was posted in Hentzell Park Update, Park Advocates and tagged Central Rec Center, City Charter, Denver Charter, Denver Parks and Recreation, Hampden Heights North Park, Hentzell Park, Jeanne Robb, Jeanne Robb Central Rec Center, Mary Ewing, Mayor Hancock, Mayor Wellington Webb, PRAB. Bookmark the permalink.